Masala Paratha as the name says, is a whole wheat flour flatbread gently mixed with various spices, ghee and loads of love. Serve it for breakfast with a cupo f tea or for meals with a dry sabji, it will taste delicious always. Here is how to make masala paratha recipe (Video). Nothing sets the mood for the day as nicely as the “chuski” of piping hot Adrak Wali Chai accompanied with your favourite breakfast, right? Just like my mom and dad, I believe in the power of breakfast, and truly believe that a decently made, healthier breakfast served as the first meal of the day, can literally revitalize for sure! Hence, every day, I make sure that my family eats the most enriching breakfast that is possible for me to make. With a bit of preparation overnight and food excel made for the week, it becomes very easy for me to serve the favourites every day. Though Ragi Banana Pancakes, Aloo Poha are some of the best options for breakfast, nothing beats the “nashta” of desi, makhan loaded hot Masala Paratha, don’t you agree? Masala Paratha as the name says, is made from whole wheat flour gently mixed with various masala powders, ghee and loads of love. 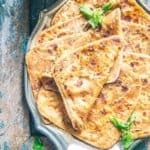 While other stuffed flatbreads like Gobi Paratha, Broccoli and Paneer Paratha, Keema Paratha, Aloo Matar Ka Paratha are two-fold with an exterior, crisp crust and tender stuffing, Masala Paratha has a chatpata taste and is crispy through out. 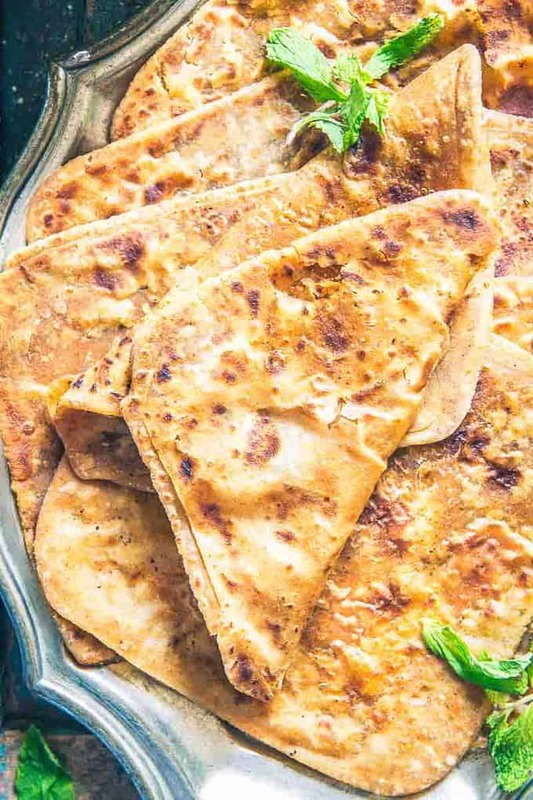 Have Masala Paratha with tea, coffee or with your choice of fresh raita, I guarantee that your day would turn out phenomenal owing to this soothing Indian meal! 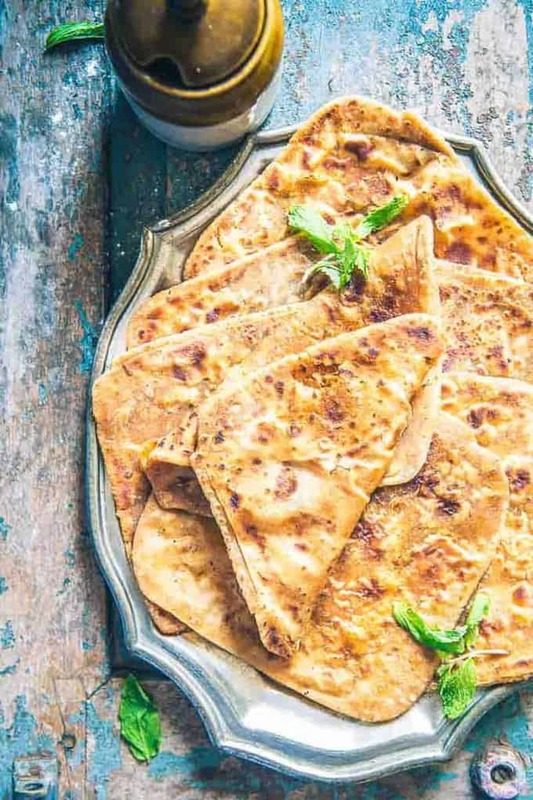 Serve Masala paratha with pickle and any raita. You can also smear it with butter and make a roll. 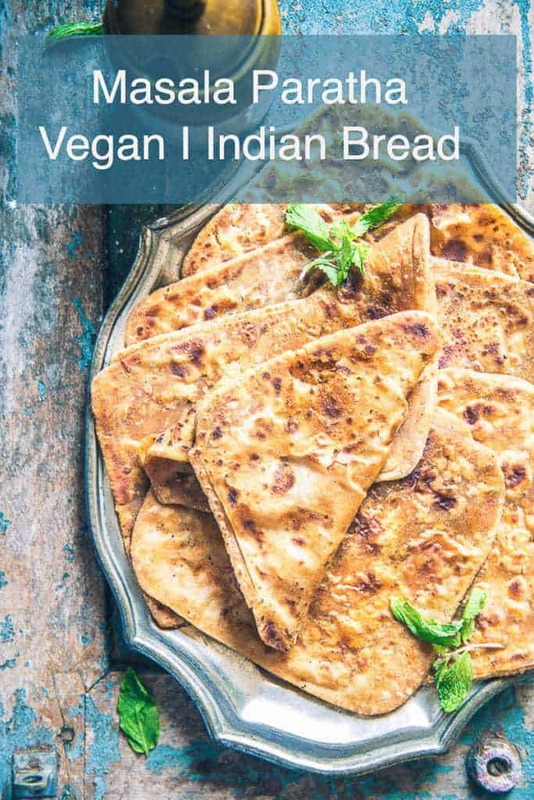 Hope you have already noted down the paratha recipe and made plans to make, haven’t you? Add whole wheat flour and ghee in a bowl. Mix well using your fingers. Add water and knead a soft dough. Cover the dough and keep aside for 30 minutes. Mix salt, red chilli powder, amchoor powder, garam masala powder, fennel powder and ajwain in a bowl. Heat a tawa or griddle. Make lemon size balls from the dough. Apply oil on the circle and sprinkle some of the powdered masala on the circle. Fold the sides to bring them to centre. Apply oil again and then fold the dough to 1/3 rd and then again till the end. Dust and roll again to make a 5 inch square. Transfer the paratha on the hot griddle. Cook until brown spots appear on both the sides. Apply oil and cook again until nicely browned. Keep pressing the paratha with the back of a ladle while cooking. Masala Paratha as the name says, is a finely made from whole wheat flour flatbread gently mixed with various spices, ghee and loads of love. Add water and knead a soft dough. Heat a tawa or griddle. Make lemon size balls from the dough. Apply oil and cook again until nicely browned. Serve paratha hot with tea or any curry.